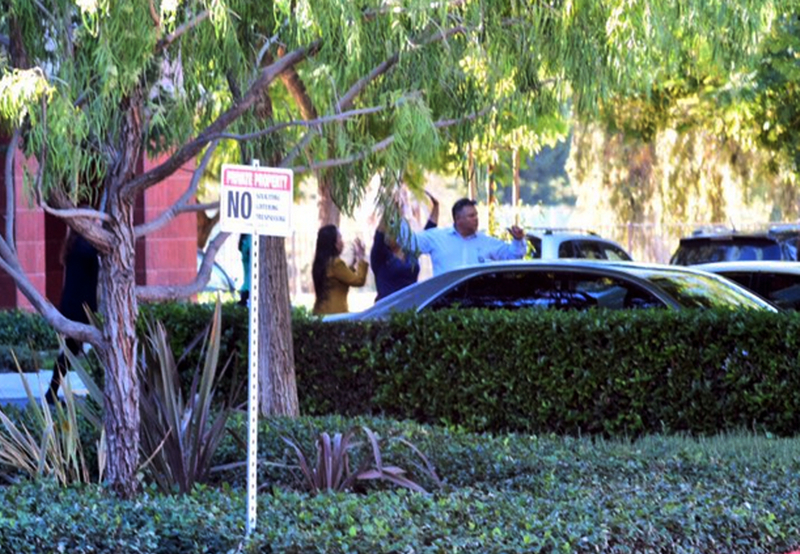 On Wednesday, there was rampant speculation on who the suspects were in the fatal San Bernardino, California, shooting that left 14 people dead. ISIS was celebrating the attack on social media with the “#America_Burning” hashtag. However, the group hasn’t confirmed responsibility for the attacks. UPDATE as of 11 a.m. ET: Per AP, his wife is named Tashfeen Malik, 27, and she was the second suspect in the case. Farook was born in Illinois and raised in Southern California, said Hussam Ayloush, executive director of the Council on American-Islamic Relations. His family is originally from Pakistan, Ayloush said. Farook traveled to Saudi Arabia earlier this year and returned with a wife, said co-worker Patrick Baccari, who attended the holiday party Wednesday but was in the bathroom when the shooting started. Baccari says Farook was gone for about a month in the spring, and when he returned word got around Farook had been married. NBC News and other outlets cited law enforcement officials as saying Farook was the suspect. His name was also mentioned frequently on police scanner radio. According to the NY Daily News, Farook is believed to be around 30 years old. His father was shocked to learn his son was a possible suspect in the massacre. However, his father said that he hasn’t seen his son in a while. UPDATE as of 8 p.m. ET: Supporters of ISIS, the Islamic State, began celebrating the mass shooting with the #America_Burning hashtag. However, there’s been no “official” confirmation from the terrorist group that they’re responsible. 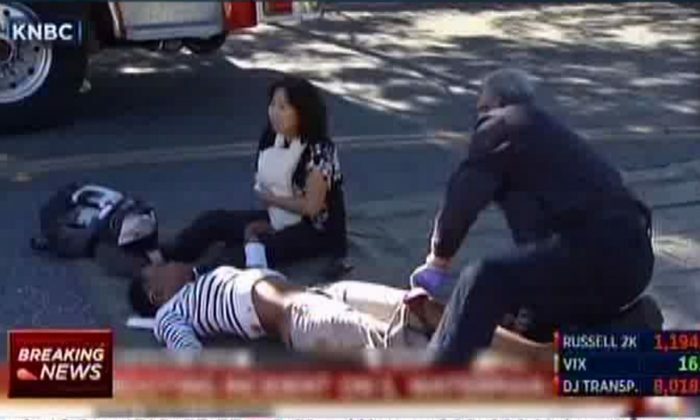 Multiple shooters reportedly opened fire at a center for the disabled in San Bernardino on Wednesday afteroon. At least 14 people were killed and at least 17 wounded in the deadliest mass shooting since the shooting at Sandy Hook Elementary School two years ago. A manhunt for the killers ended in a shootout that left a man and a woman, two suspects, dead. A third person was reportedly arrested and a police officer was shot and has non-life-threatening injuries. Farook is believed to have San Bernardino County Public Health Department, which was holding a holiday party at the center when the shooting occurred. Some people on social media were claiming that “Tayyeep Bin Ardogan” was the second suspect in the case. Los Angeles Times reporter Rick Serrano tweeted that it was but he took down the tweet and said it was probably a hoax. The name “Tayyeep Bin Ardogan” bears a strong similarity to Recep Tayyip Erdogan, the Turkish President. The name “Farooq Saeed” was gleaned from San Bernardino police scanner traffic, which can be notoriously unreliable. Some were circulating an article from a website called WeaselZippers.com, which says it is “scouring the bowels of the Internet,” that said the suspect’s name is “Farooq Saeed,” based on scanner traffic. Notorious hacker, “Th3j35t3r,” also posted the name to his 70,000 followers. Meanwhile, conservative blogs were reposting the name in the headline, likely to garner Google search traffic. There were also hoax rumors that said “Sam Hyde,” the Massachusetts-based YouTube comedian was responsible, claiming he’s a white supremacist or neo-Nazi. His name gets tossed around frequently after shootings in the United States, and it’s definitely fake. Others were speculating on Twitter that the shooting suspect is a “lone wolf” white male, which is the stereotype of mass shooters in the United States. Following the Planned Parenthood shooting last week that left three people dead, there were Twitter users spreading rumors that ISIS was involved in that attack too. The suspect in the case, 57-year-old Robert Lewis Dear, was later arrested, and he didn’t have any ties to a known terrorist organization.